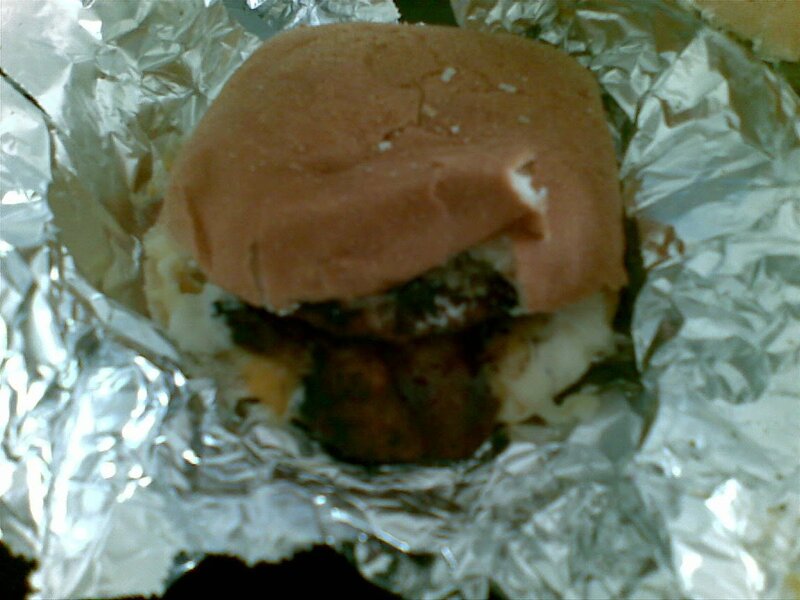 The first time I saw Good Burgers was near a pancitan restaurant we frequent along C-5. Their tagline “Hot Chix With Big Buns” always caught my attention, but I never did bought from them. 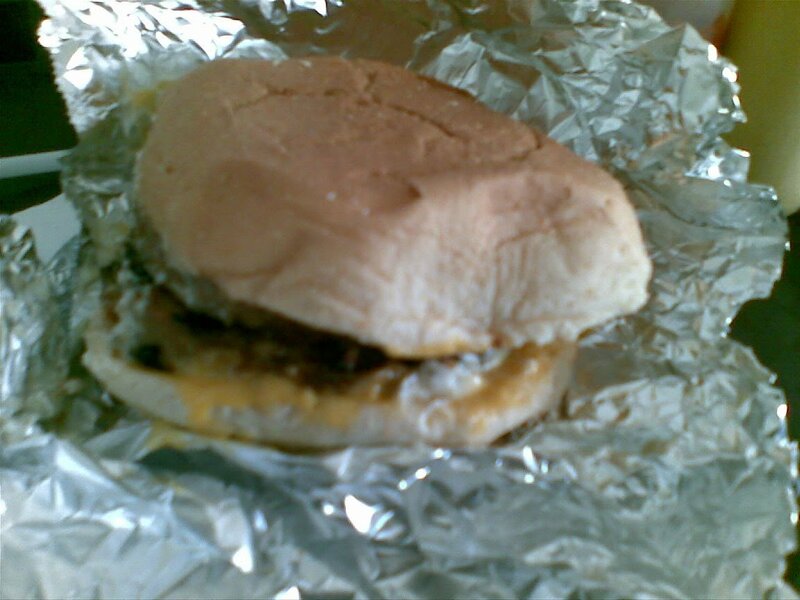 The first time I tasted their burgers was when my mom bought them home one day for lunch. The first time I actually went there was with beloved yesterday on the way home from a party at a friend’s house. Anyway, I digress. On to the important stuff: the munchies. Good Burgers. What makes it good? Well, for one, its burgers are only made of either chicken or veggie meat. But is it really good taste-wise? I only got to take a glance at the menu because of hunger. I believe the prices range from 60 to 120 Php, depending on the size of the burger and the condiments. Both of us chose the “3 Cheese” burger, with beloved having chicken patties and me taking the veggies. It costs 120 Php for the biggest size. 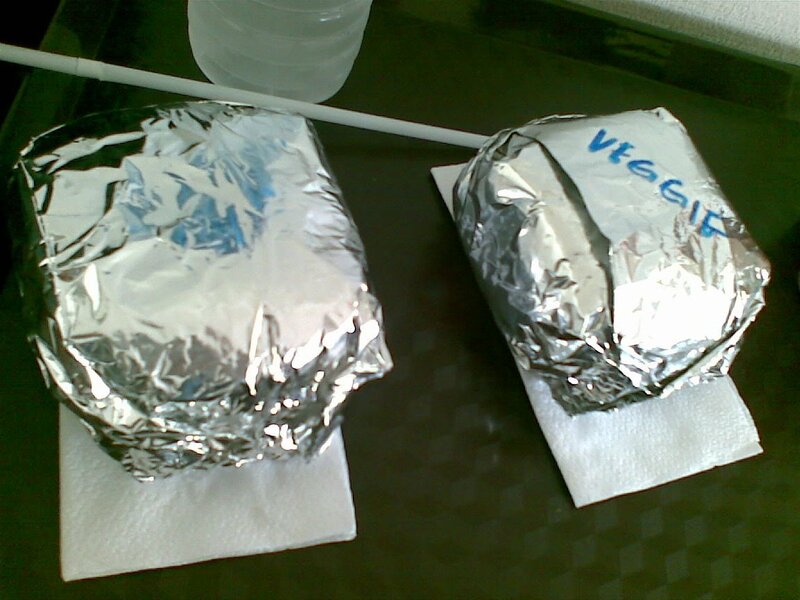 They came packed in aluminum foils, probably considering this is more of a take-out store than a dine-in one. When we opened it up, we find two patties smothered in cheese in between two buns. The buns are not as soft as your usual burger bun, but it’s all right. The cheeses; stringy mozzarella, tangy cheddar (though they called it “cheese sauce”), and slightly sour cream cheese; provided that cheesy taste and texture I like. This makes it feel like you’re eating stringy cheese pizza. Now, the important part: the burgers. While they do have the same texture as your beef or pork burgers, as I’ve said earlier, they’re made of chicken or veggies. I’ve tasted their chicken patties before, and it tasted a bit on the hot side and was quite heavy. It’s also pretty lean and grilled to well done. You can taste the chicken quite so. As for the veggie patties, it was my first time tasting it. It has the same hot sensation that fills your mouth on each bite. I can’t tell what veggies the patties are made of, but if I had to guess, I’d say a mixture of rice or beans and mushrooms. I can taste some meatiness from the mushroom and the grainy taste of rice. The downside of these burgers are their uniqueness as well: their leanness. The fact that they’re lean and healthy makes them lose one of the better qualities of a tasty burger: the juice. While some may think its unhealthy grease, I say it’s flavorful juice. The buns on this burger practically has no use aside from holding the burgers together as they don’t have any juice to absorb from the burgers. Without the juiciness you’ll find in beef or pork burgers, it lacks that tasty succulence that the usual burger provides. Well, that’s what you get for being healthy. Considering it’s a healthy burger, it’s still pretty good. A lack in juiciness, yes, but it’s quite filling. Perhaps with this joint, it’s your choice of topping that makes the meal whole. The burgers are there to fill you up good. I don’t know if I’ll have it often, from time to time probably, but not too often. For the price, it’s a good deal, and a filling healthy meal. Location: Maginhawa Street, Sikatuna, Quezon City, between Bayan Diliman and Savemore Anonas. Recommended for: Hungry health watchers. Not recommended for: Juicy meat lovers. Smart nomnomnom tip: This is a take-out shop, so pass by on your way home; burgers are wrapped in foil to keep your food nice and hot.